The Estes Yankee was the first rocket that Philip Blattenberger built pretty much by himself. I say pretty much because I did provide some guidance during the assembly and painting. This picture was taken in our back yard in Smithsburg, Maryland. 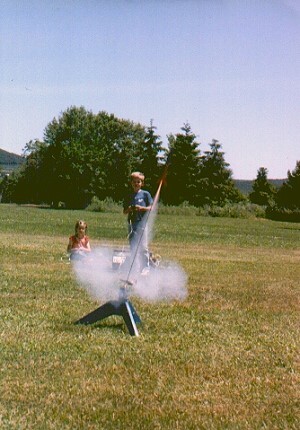 We had about 1½ acres in the country and were able to launch rockets (and fly airplanes) from the the yard. It was pretty nice until a bunch of houses were built around us. This is a very cool picture, if I do say so myself. A Minolta 35 mm SLR camera was used with 400 ASA film. It was taken sometime around 1992, before digital cameras. The launch pad is a custom designed and built model that is made of pine wood and painted enamel blue. A piece of 1/8" music wire serves as the launch rod, and the blast shield is made from a tin can bottom. The angle of the launch rod is adjustable with a thumb screw. As you can see, the wind was pretty strong that day since the angle is pretty high.